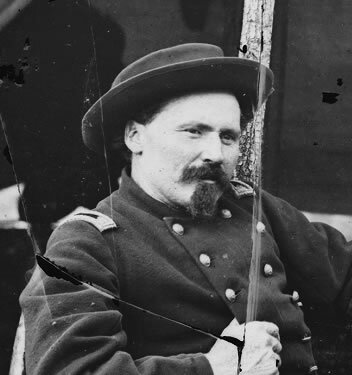 A brand new Lieutenant at First Bull Run in July 1861, George A Custer later recalled with envy a gallant charge by a squadron of the 1st US Cavalry under Capt Colburn early in the battle. The charge may not have actually happened, which is sad for the romantics like Custer, particularly as the first major battle of the War was Colburn’s last in hands-on field command. Albert V. Colburn is best known now as Assistant Adjutant General (AAG) to George McClellan during the General’s terms in command of the Army of the Potomac. Students of that army will come upon Colburn’s name frequently–on orders, reports and letters–as he so often served as the voice of the General Commanding. Colburn already had some military experience by coming of War in 1861. Born in Castleton, Rutland County, Vermont in 1831, he had attended the US Military Academy, and graduated with the Class of 1855. First Lieutenants. : William N. R. Beall ( Brigadier General C. S. A.) George H. Steuart (Brigadier General C. S. A. ); James McIntosh (Brigadier General C. S. A., killed in action); Robert Ransom (Major General C. S. A. ); Eugene A. Carr (Brigadier General U. S. A. ); Alfred Iverson (Brigadier General C. S. A. ); Frank Wheaton (Brigadier General U. S. A.). Second Lieutenants. : David S. Stanley (Major General U. S. V., Brigadier General U. S. A. ); James E. B. Stuart (Major General C. S. A., mortally wounded); Elmer Otis (Colonel U. S. A. ); James B. McIntyre (Major and Brevet Colonel U. S. A. ); Eugene W. Crittenden (Major U. S. A. ); Albert B. Colburn (Lieut. Colonel Staff U. S. A. ); Francis L. Vinton (Brigadier General U. S. V.); George D. Bayard (Brigadier General U. S. V., killed in action); L. L. Lomax (Major General C. S. A. ); Joseph H. Taylor (Lieut. Colonel, Staff, U. S. A.). In March 1861, the new Commanding Officer was Colonel Robert E Lee. Lieutenant Colburn served with that illustrious outfit in the West, first based at Ft Jefferson, Missouri and then in “quelling the disturbance” from Ft Riley in “Bloody Kansas”. He was on the Cheyenne and Utah Expeditions (1857, 58) and was Adjutant of the Regiment from 1857 through July 1861. In July he returned East from Ft Riley leading 4 companies of troopers and commanded an independent squadron–Companies A and E–of his Regiment in action at First Bull Run. Dramatic charge or no charge. Very shortly after that battle he was appointed Assistant Adjutant General on the staff of Major General George B McClellan, commanding the Army of the Potomac. 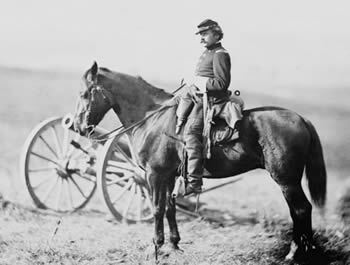 He remained in that position until November 1862 when General McClellan was relieved of command. Soon after the outbreak of War in 1861 he had also been offered a command of his own as Colonel of the new Third Vermont Volunteer infantry by Governor Erastus Fairbanks, but declined. As had fellow Regular Army Captain Truman Seymour. The Governor later got, instead, an older Regular, William F. “Baldy” Smith for the job. As I did when I read about Colonel Sackett, I wonder slightly why Colburn took the staff position over command of a Volunteer Regiment. In any case, he was promoted to Captain (Staff/AAG) in the Regular Army in August and Lieutenant Colonel (Staff, Aide-de-Camp) in September 1861. He was also given the rank of Major (Staff/AAG) in July 1862. He was at Headquarters of the Army with the General Commanding in Washington DC until March and then took to the field on active operations: on the Peninsula Campaign to August and in Maryland for the remainder of his General’s military career. Colburn lost his position when McClellan was relieved of command of the Army of the Potomac on 5 November 1862, and traveled to New Jersey with the General while also awaiting new orders. An event of particular local interest was the arrival here of General George B. McClellan after he was relieved by executive order from the command of the Army of the Potomac, with instructions from the General-in-Chief to turn his command over to General Burnside, repair to Trenton and report for further orders. General McClellan arrived in Trenton at 4 a.m., November 12, 1862, on the “owl train” from Washington. He was accompanied by Colonel E. H. Wright, son of former United States Senator William Wright, of Newark; Lieutenant Colonel E. M. K. Hudson, Lieutenant Colonel Paul von Radowitz, Lieutenant Colonel A. V. Colburn, Captain J. C. Duane and several other officers, civilians, clerks, etc. They proceeded directly to the State Street House (now the Hotel Sterling), then under the management of Charles M. Norcross, where quarters for himself, family and staff had been reserved, and where Mrs. McClellan with her parents, General and Mrs. Marcy, and near friends were anxiously awaiting their arrival. Unlike his former boss, however, Colonel Colburn did get another posting. In December he was assigned to the staff (at the request ) of Major General John Schofield as Adjutant-General of the Department of the Missouri. However, quartered in St. Louis, Albert died there six months later on 17 June 1863, of illness. 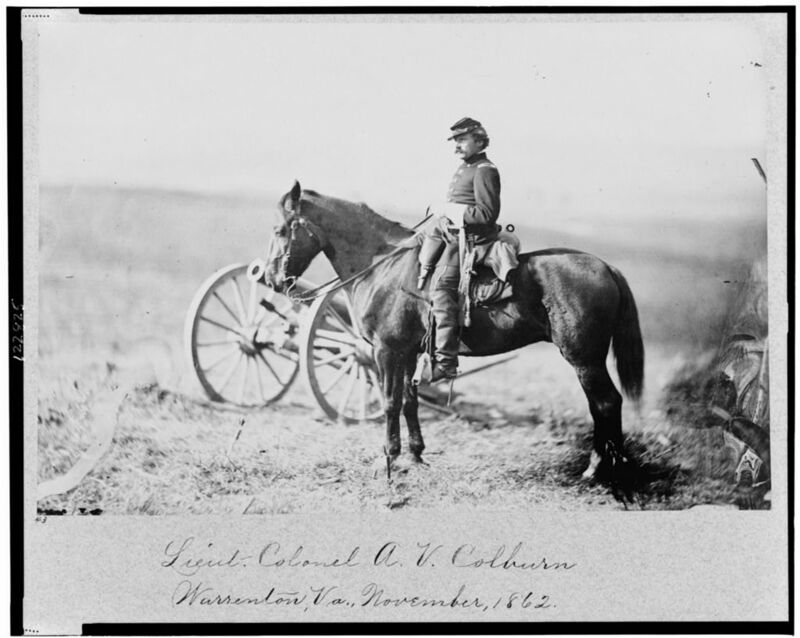 The equestrian photo of Colburn at the top is from the Library of Congress collection, credited to a Brady staffer, and is available online. Edward G. Longacre notes Custer’s recollection of Colburn’s charge and the lack of documentary support for it in Lincoln’s Cavalrymen (2000, Stackpole Books). Colburn’s birthplace and year are from the Grenville Dodge Norwich University History (1911), of which Volume 2 is online. Appendix J (pg. 315) to the The Life of George Dashiell Bayard has a brief biography of Colburn for further color. His military career is detailed in Cullum’s Register (online from the USMA Library). Colburn’s Cullum Number is 1693. The CDV of the Colonel reproduced here was recently sold on eBay. I don’t know the buyer/current owner. The fascinating list of the officers of the First US Cavalry of 1855 and their later War service is from Theophilus Rodenbough’s Fourth Regiment of Cavalry, part of his Army of the United States 1789-1896 (New York: Maynard, Merrill & Co., 1896) and that volume is excerpted online, on the US Regulars site. The quote about McClellan’s arrival in Trenton in November 1862 is from Chapter XIII of A History of Trenton 1679-1929 published by the Princeton University Press (1929), originally written and (more recently) posted online by the Trenton Historical Society. The last portrait of Colburn here is a detail from a group shot of him with Colonel Sackett and General Sedgwick taken in August 1862. The whole of it was presented in the Delos B Sackett post previously on this blog. Good stuff as usual, Brian. Let’s keep in mind that, particularly with Bull Run, lack of documentary evidence is not such strong support that something didn’t happen. As the war progressed the system of reporting became more regular. At the time of Bull Run, it was mostly hit or miss. I’ll try to see what I can find out about the charge in question. Texas, taking his final discharge at Fort Concho, Jan. 1, 1872. Would it be possible to get in touch. I have just returned from a family-history visit to Hernando County, Florida where A.V. Colburn’s mother took up residence during her widowhood from John Peabody Colburn, Jurist of Rutledge, VT [d. 08 Dec 1831]. If you wish further details of the Colburn’s home life and photographs, you are welcome to contact me. I am a history teacher in Castleton, Vermont. I do teach a unit on the Civil War and would be interested in more information on Colburn’s home life in the Castleton/Fair Haven area. I am researching the First Battle of Bull Run and cannot find who was Captain of Company A 4th (1st) US cavalry under Captain A V Colburn on July 21, 1861. Any help would be appreciated. Capt. Colburn with Companies A and E participated in the battle of Bull Run, and was favorably mentioned by the division commander, Col. Heintzleman [sic]…. Everything I’ve read so far says Colburn was in command of both companies, though Barry says that the two “troops”, or one squadron, totaled only 100 men, so with regular officers at a premium, I doubt that two captains – or three – were in charge of so few men. Colburn’s personal life as a young man in Fair Haven, Vermont, will be touched upon in the upcoming biographical novel: Jenkins: Confederate Blockade Runner to be released on Amazon.com January 18, 2011. Colburn’s brother-in-law was C.T. Jenkins, Floridian convicted of blockade running after being captured by forces operating under Alexander A. Semmes of the the East Coast Gulf Squadron. I, and more dramatically my daughter, have quite a bit of data on the Colburn family back to their arrival from England in the 1600s. Also the Read (Reed, Reade) family, my paternal grandmother’s family. Moses McClellen Colburn, one of Albert Vincent’s brothers (b.1825) attended UVM and moved to Michigan where he died as a minister. I have always been facinated by the name connection between Moses’ middle name of McClellan and Albert’s military connection with George McClellan. I have not uncovered any further connection, but it would be a strange middle name if it were not a family name. Can you shed any light on this mystery? Hello David, and thanks for the excellent family information. I do not have anything further on a possible McClellan connection, but I hope another of our readers will add to the story.